My Dental Check-up: Plastic Free? I wish that I could answer with a resounding YES. Unfortunately the answer is no. Every prior visit to the dentist I’ve taken their little plastic bag full of goodies (brush, toothpaste & floss) without a thought. This week, I got up the courage to say no thank you to the bag, travel size floss and toothpaste. I did however bring home the toothbrush for myself & husband. Three out of four is improvement, right? There’s still guilt lingering. 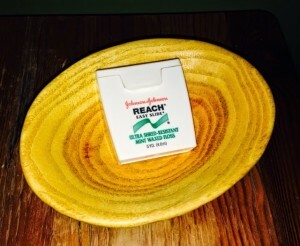 See the picture of the cute travel size dental floss container from my last dental checkup? Is it recyclable? No. Neither are the toothbrushes. I’ve never contemplated what to do with a empty dental floss container other than toss it. As soon as I throw it in the garbage my kids will say, “But Mom we can reuse it! It can be this, and this and this.” I decided to look for ideas to reuse floss containers. I found a good article from Rebecca Rockafeller on Trash Backwards. I think I might use mine to store small safety pins in my sewing kit for now. Maybe my husband can thread some fishing line on one for a pocket for emergency use. I found some cute ideas on Pinterest for repurposing a floss container into a travel sewing kit. Since I refused the floss at the dentist I’m waiting on a package of new Eco-Dent floss to arrive from Vitacost this week. They claim plastic free packaging. What would be superb is if the floss itself could be composted. That would be zero waste!